Q. Why call it a club, when its technically a semi-(dis)-organised gathering? A. No one is going to spontaneously type ‘Manchester chess gathering’ into Google. Q. I’m already a member of another club, which I have great loyalty to, so it’s not appropriate for me to come to MSCC is it? A. Why not? We’re a gathering of chess enthusiasts, we don’t play rated games. Come here, we’ll help you get better, you can then go and win lots of rated games for your club. 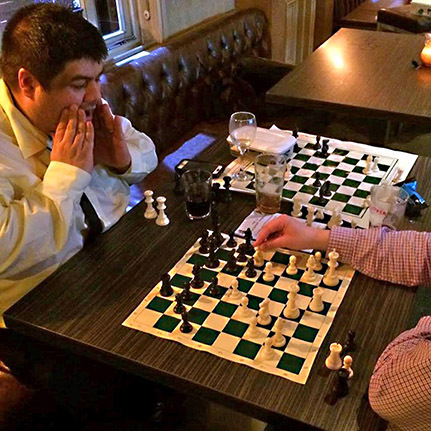 We’re a resource for all Manchester chess enthusiasts. Q. I’m completely rubbish, I don’t think I’m good enough to come along, should I bother? A. Absolutely, we’re very friendly. We can help you improve and if you like we can play some form of handicap system to give a more level playing field. Q. You meet in the bar area of a pub, not a private room. Isn’t it noisy, sometimes loud and full of non-chess players? A. Yes. But that isn’t a bad thing. It isn’t too noisy, it is rarely very busy on Tuesday nights and the environment is friendly and fun. Sometimes these ‘non-chess players’ turn out to be 1900 FIDE rated players from Denmark. Q. You meet in the bar area of a pub. I don’t drink, it’s not for me, is it? A. This is 2017, the pub serves coffees and a wide range of soft drinks. It’s a chess club that is run on a work night, so there is little debauchery I’m afraid. Q. What is typical turnout like? A. We’ve been running for a year and turnout has ranged from 3 (during a thunderstorm) to 17, averaging at around 10. I think we can do better as the message gets out. Q. Why are the words Manchester Chess Club included, sometimes rather artificially, on each page of this website? A. The first draft of this website didn’t appear on search engine results for Manchester Chess Club. As this is the first, and practically only, thing a chess enthusiast would search for when looking for chess in central Manchester we’re trying to give google a little help! Q. Okay, I’m interested. How do I get involved? A. You can simply turn up on a Tuesday. However, we’d be delighted to hear from you via e-mail or Facebook (details above) if you’d like to say hello first or ask any questions. Copyright © 2016. Aglarond Design - All Rights Reserved.